Egypt's Presidential Elections Commission (PEC) has declared former military chief Abdel-Fattah El-Sisi Egypt's new president, confirming that he won 23.78 million votes (96.91 percent) in the 26-28 May election. El-Sisi's sole contender, leftist Hamdeen Sabahi, took a modest 757,511 of the votes (3.09 percent). According to Judge Anwar El-Assi, 25,578,233 voted in the elections, a turnout of 47.5 percent. Spoilt votes exceeded the votes for Sabahi, with 1,040,608 invalidated ballots. The official results announced by the PEC cannot be appealed, as per the presidential election law issued by interim President Adly Mansour on 8 March. The election was scheduled to take place over a period of two days, but the PEC made a last minute decision to extend voting by an additional day, attributing its decision as a response to calls by "large swaths of the people". The decision was appealed by both candidates, but the appeals were turned down by the PEC. El-Assi said during Tuesday's press conference that the voting was at its peak during the night and morning, with 10 percent of those who voted coming on the third day. The number of polling stations was 13,899, said El-Assi, who added that the increase in the number of stations – up from 13,099 – contributed towards increasing the turnout and making the voting process smooth. Sabahi filed another complaint – also turned down by the PEC – over allegations that El-Sisi campaigners were present inside and outside of polling centres. The complaints didn't influence the results of the poll, the PEC said. Egyptian expats voted abroad from 15 to 19 May in 141 polling stations in Egyptian consulates and embassies worldwide. The PEC announced earlier that out of 318,033 Egyptians who voted abroad, El-Sisi won 296,628 (94.5 percent) of the votes, while Sabahi got 17,207 (5.5 percent). Invalid votes totalled 4,198. El-Sisi got 10 million more votes than Morsi did in the 2012 election, which enjoyed a slightly higher turnout of 50 percent, as compared this year's 47.45 percent. 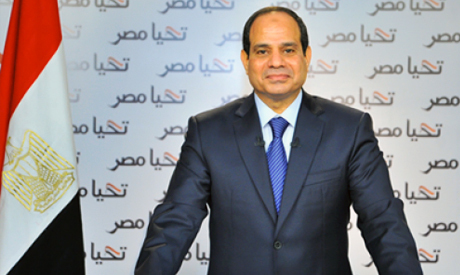 According to sources who spoke to Ahram Online, El-Sisi will be sworn in before the High Constitutional Court either on Saturday morning, 7 June or a few days later. The event will be followed by an evening inauguration ceremony to be held at east Cairo's Ittihadiya presidential palace, expected to be attended by a number of foreign leaders, mostly from the Arab world, as well as senior Egyptian politicians, high-ranking officials, and Prime Minister Ibrahim Mahlab, whose cabinet is obliged by the constitution to resign from office after the results of presidential polls are officially announced. Celebrations have already started in several places across Cairo with tens of thousands already in the streets and major squares such as Tahrir and Ittihadiya palace. This was the first foreign-monitored election in Egypt's history. The European Union had 150 monitors across Egypt, which the EU said maintained their impartiality, neither legitimising the Egyptian electoral process nor validating the election results. The African Union and the Arab League also observed the election. The EU's Election Observation Mission (EOM) released a preliminary statement on Thursday after voting commenced, stating that "the Presidential Elections Commission (PEC) administered the election professionally and overall in line with the law." However, a later statement from the EU mission detailed several violations, notably biased coverage in favour of El-Sisi in private media outlets, campaign spending for El-Sisi that surpassed the PEC's stipulated limits and an atmosphere of stifled dissent. The presidential election is the second milestone in a transitional road map announced by the army following the ouster of Mohamed Morsi last July. The third and final step of the road map will be parliamentary elections, expected to take place by the end of the summer. Great fabrications to hear...its ok what about that Thahrir squar 30million peaople,,,wht do they restrain from voting...?????????? Mabrouk to the Egyptian people and to the new President El-Sisi - wishing you all the best to make Egypt once again the country the whole world looks to - Omn El Donya, security and stability in all aspects, which will bring prosperity and Tourism back fully restored, and much much more. So happy to see so many Egyptians so happy.